KEY QUESTIONS: Can we tell who people are and what they are like from their appearances? What is important about us? What would it be like if everyone was the same? the skin I’m in looks good to me. It will let you know one small way to trace my identity. But then again the skin I’m in will always be just a covering. It cannot tell my story. 3. Bring the group back together for whole class discussions of key points from their small groups and discuss as a group: How do we let others know who we really are/what we are really like? You could discuss the importance of small talk and conversation and people actually meeting to help them know one another. If appropriate you could extend the discussion to: What, if any parts of identity might we be able to know from people’s appearance? 4. How do the images shown help us understand the words? What other things do we notice about the images? 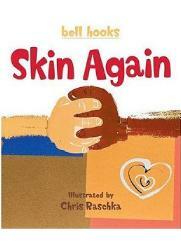 Quotes in this resource are from Skin Again by bell hooks, illustrated by Chris Raschka. Text copyright © 2004 by bell hooks. Illustrations copyright © 2004 by Chris Raschka. Reprinted by permission of Disney • Hyperion books, an imprint of Disney Book Group, LLC. All rights reserved.